Mini Cart Pro for VirtueMart Joomla Module Created by SmartAddons. This templates have specific characteristics, namely: Powered by VirtueMart component, SJ MiniCart Pro is released to enable elegant checkout process. Whatever your Website is selling, this module will increase conversion rate, much more greater, by bringing your Website a mini bar with all function of an e-cart. Less steps that customers have to do . You can use this Mini Cart Pro for VirtueMart Joomla Module on Plugins category for cart, Cart Pro, ecommerce, mini cart, minicart, virtuemart, virtuemart 3, virtuemart cart, virtuemart cart pro and another uses. Powered by VirtueMart component, SJ MiniCart Pro is released to enable elegant checkout process. Whatever your Website is selling, this module will increase conversion rate, much more greater, by bringing your Website a mini bar with all function of an e-cart. Less steps that customers have to do when checking out, more products you sell! Basically, this module is a nice bar presenting status of the shopping basket that your customers have made during the selection process. 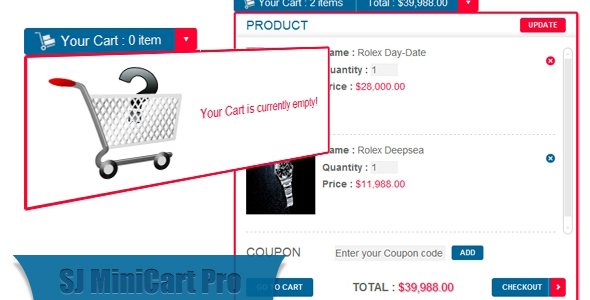 By using SJ MiniCart Pro, your Website can show customers the image, title and price of products inside the basket; just by one hover of mouse! Besides, there are many parameters that you can tweak to suit your need like: having coupon code enabled OR not, changing width and height of each images, showing Checkout buttons…Let view our Demo to fell more!